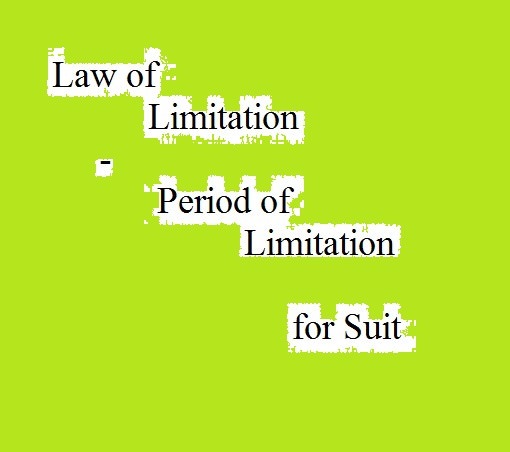 The law of limitation prescribes the period within which existing rights can be enforced in a court of law. The object of the limitation act is to prescribe the period within which the existing right can be enforced in the court of law. (a) The period of limitation for filing suit for recovery of money lent under a Demand Promissory Note is three years from the date of execution of documentation. The DP Note may not be accompanied by the security way of pledge or at date of disbursement or balance confirmation. If investment is on a bond where no date is specified for payment, a suit has to be filed with in three years from the date of execution of the bond. If a bill of exchange is payable at sight or after sight but no fixed time, the limitation is three years from the date when the bill is presented. If an investment is made on a mortgage of immovable property or other wise secured by a charge upon immovable property & money is payable by the mortgager on demand or no installment are agreed to , the banker must file suit with in twelve years from the date of the mortgages deed. If the mortgage money is payable by installments and the mortgage deed provided that if default is made in payment of one or more installment the whole amount shall be fall overdue. The period of limitation is twelve years from the date when default is made in respect of which there is no such waiver. If the Banker wants a decree against mortgager, the banker will have to file suit with in three years of the execution of the mortgage deed or the date of default, as the case may be. 67 On a single bond, where no such day is specified. 69 On a bill of exchange or promissory note payable at a fixed time after date 3- years When the bill or bond falls due. 70 On a bill of exchange at sight or after sight, but not at a fixed time. 3- years When the bill is presented. 72 On a bill of exchange or promissory note payable at a fixed time after sight or after demand. 3- years When the fixed time expired. 75 On a single bond , where a day is specified for payment On a single bond where a day is specified for payment 3- years When the default is made unless where the payee or oblige waives the benefit of the provision & when fresh default is made in respect of which there is no such waiver. 78 Which the payee against the drawer of a bill of exchange has dishonored by non-acceptance. 3- years The date of the refusal to accept. 81 By surety against the principal debtor. 85 For the balance due on a mutual, open a current account, where there have been reciprocal demands between the parties. 3- years The close of the year in the last item admitted or is entered in the account, year to be computed as in the account. 132 To enforce payment of money secured by a mortgaged or otherwise charged upon immovable property 12- years When the money sued for becomes due, a suit on a simple mortgage deed to enforce payment of money due of the bond, by the sale of mortgaged property is governed by this article to attract the application of this article, the money must be effectively charged on the immovable property. 144 For possession of immovable property or any interest there in based on title 12- years When the possession of the defendant becomes adverse to the plaintiff. 145 To recover movable property deposited or pawned from a deposited or pawned from a depository or Pawnee. 30- years The date of the demand. 148 Against a mortgage to redeem or to recover possession of immovable property mortgaged 60- years When the right to redeem or to recover possession accrues due. (a) Fresh documentation If the client executes a fresh promissory note or new bond etc for the old debt the limit is automatically extended from the date of fresh documentation. The documents may even be executed after the period of limitation has expired. (b) Acknowledgement The limitation for filing a suit or an application in respect of any property or right can also be executed by an acknowledgement. The acknowledgement has to be in writing, signed by the party against whom the liability is sought to be enforced or by his duly authorized agent across the requisite revenue stamp, before the expiry of the prescribed period of limitation. (c) Part- Payment Part payment of a debt or interest can also extend the period of limitation, provided the borrower or his duly authorized agent under his signature has authenticated such payment. The part payment should also have been made before the expiry of the prescribed period of limitation. The period of limitation in any account must therefore, be watched from time to time. Every Bank should have on limitation register. Whenever any documents are executed by the investment client, they are entering into it, besides security register. It serves the purpose of dairy. The limitation register or the limitation dairy is maintained according to the date of limitation. While obtaining fresh documents from the client in renewal of the original , the banker should obtain a ‘Link Letter’ or a ‘connecting Letter’ from the client. The parties cannot, by agreement, expressed or by implied, extend or alter the period of limitations laid down by law. It is also not possible for them to waive limitation by agreement. An agreement not to raise the plea of limitation in cases a suit/ application / appeal is inoperative & ineffective. Non-Judicial Stamp – It is printed in a specialized paper having of several value, used for contract, mortgage, sale contract, etc. As per the clause –12, adhesive stamp must be cancelled at the time of affixing the same and with out cancellation document will be treated as stampless. The vender / beneficiary of the stamp can cancel the stamp by affixing / writing ‘Cancelled’ along with date and signature. But it is observed from the branch record that stamps are not executed in related documents as per Stamp Act mentioned above, which may hamper the Bank’s interest and as well as may cause for financial loss.